Owner Earl Bamber (second left, in front) and his EBM team celebrate winning the Bathurst 12 Hour on Sunday. He has been a world endurance champion behind the wheel and now expat Whanganui driver Earl Bamber can add victorious team owner to his resume as Earl Bamber Motorsport won the Bathurst 12 Hour on Sunday evening. Bamber, 28, led the two-car operation that has given his Porsche factory one of the few endurance crowns the motorsport giant had yet to win. It was also the final race victory for this generation of Porsche GT3 R car, which the factory will soon replace, as Australian Matt Campbell drove the wheels off it in the last 30 minutes of the race to get up from fifth to first place. 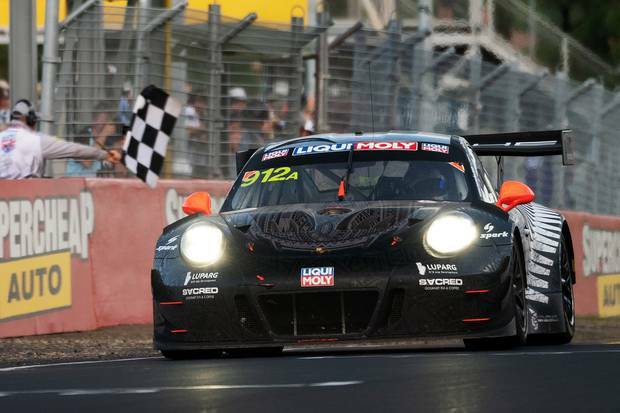 Campbell shared the podium with his EBM co-drivers Dennis Olsen and Dirk Werner, as the 2019 edition of the Bathurst race will go down as one of the most exciting. The distance record was smashed due to long green flag runs earlier in the day, while the late race restart meant there were seven cars on the lead lap, respresenting six different brands, when the time limit expired and it was time to race for the checkered flag. Porche's 912 car started from sixth on the grid while the other 911 car was 10th, and ultimately had to retire after 234 laps due to the loss of power steering. Both cars had been around the lead throughout the race as Bamber looked to employ a different fuel pit strategy from the other teams, while his drivers looked to stay out of trouble to take advantage when other cars pulled out with mechanical issues or after crashes. The 912 team stuck with their plan to take fresh tyres as well as more fuel on their last pit stop, which the trailing cars did not do as their crews just added fuel quickly to get out ahead of Campbell for the anchor laps. In the leading Aston Martin, British driver Jake Dennis had a good restart and managed to pull away from the pack briefly. However, on fresh tyres, Campbell was going gangbusters and made an aggressive push to get past the other Mercedes of pole sitter Raffaele Mariello with 17 minutes left. The young Australian then caught up with Dennis with 11 minutes remaining, and drove the nose of his Porsche on the inside line at the famous Elbow turn which leads down to The Chase – the long straight heading to the finishline. Campbell forced his way through and then defended his lead on the dash down The Chase, with Dennis trying to get alongside him but being unable to pull him back. The Porsche, emblazoned in New Zealand colours with black and the silver fern, went on to claim victory by 3.4 seconds. "We wanted it badly. You see the guys celebrating here," said a delighted Bamber in his televised pitlane interview. "It was a crazy one month to be able to try and pull this off, I have to thank everyone in the team. "We worked flat out, days and nights. I mean, I think I slept three hours every night this week, prepping everything." Bamber singled out team manager Greg Wooster and his younger brother Will Bamber, who moved from Whanganui to join him in Kuala Lumpur as they set up this new racing organisation. "These guys, this team, is just a monster, and this is just the first one for us," Earl Bamber said. "Matty Campbell, incredible drive. Amazing, didn't put a foot wrong, he was absolutely perfect. "That was a proper motor race, that was absolutely incredible, nail-biting. "We're going to celebrate a lot tonight." There was a mild controversy as EBM had to wait for the result of a post-race investigation which cleared Campbell of any infringement in his 'bump and run' pass of the BMW driven by former Bathurst 1000 winner Chaz Mostert. The two drivers clashed in The Chase with 30 minutes left as Campbell made contact with Mostert coming into the left-hand part of the corner after he followed the BMW on the slipstream through the right-hander side. That pass put Campbell into third with enough time left to go chase down the Mercedes cars. The stewards reviewed the footage and determined that the pass was legal.